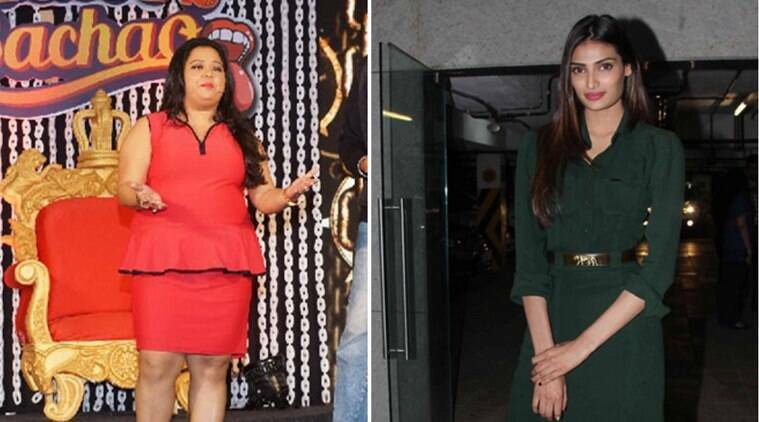 Comedian Bharti Singh, who appears on new TV show “Comedy Nights Bachao”, poked fun at actress Athiya Shetty's sleek physique by calling her a “hockey stick”. Athiya Shetty will be seen in the forthcoming episode of “Comedy Nights Bachao” along with Bollywood superstar Salman Khan. Comedian Bharti Singh, who appears on new TV show “Comedy Nights Bachao”, poked fun at actress Athiya Shetty‘s sleek physique by calling her a “hockey stick”. Daughter of actor Suniel Shetty, Athiya, who has made her Bollywood debut along with Sooraj Pancholi with “Hero”, will be seen in the forthcoming episode of “Comedy Nights Bachao” along with Bollywood superstar Salman Khan, who is co-producing the film along with veteran filmmaker Subhash Ghai. Bharti, along with her co-star Krushna Abhishek, was seen poking fun at the guests. It was clearly a joke on her own rotund frame. After that, Krushna called Bharti and Athiya a “perfect 10”, with Athiya being the one and Bharti the round zero. The episode featuring the “Hero” stars will air on Saturday. 1 How Madhuri Dixit got her Bollywood debut?